Visits increased by 22% from 436 000 to reaching over half a million for the first time in one year. From 1 January 2011 – 5 December 2011 this blog has been visited by just over 530 000 individuals. Page views, which increased by 33%, are creeping closer and closer to the 2 million mark. The other homegrown mobile instant messaging app that claim to have 10 million users (a claim which I believe) is 2go. There have been a few ways to get 2go to run on your PC but there is nothing like the official version. If you’ve not heard of 2go before here is the first post Yasser did in 2007. Usually I’d like to consider myself an early adopter of mobile tech but when I first installed WhatsApp on my Google Android device I was shocked to see over 100 of my contacts were already using it! The easy installation and scanning and auto-adding friends from my contacts without having to invite them if they’re already using it sure is proving to work out well for them. I also like the fact that it works on the major smart phones Nokia, Android, Blackberry and iPhone. Hopefully we’ll see more awesome mobile web goodness in 2012. No matter what any Social Network tells you about using your real name or how your privacy is being abused or misused. When it comes the the wwworld we still want to be anonymous sometimes. Qooh.me is a simply Q&A mobile app that plugs into various social networks and allows your to ask questions to your friends or strangers anonymously. The MXit pin via SMS service generates about R500000 every with the premium SMS short code. This makes MXit and the Mobile service providers happy but when you try using as little airtime as possible you need an alternative. MXit now allows you to retrieve your password via email so be sure to configure your email address in your MXit account settings. Part of the MXit users evolution will lead them to Facebook some time or another. Now this MXit/Facebook App allows you to chat to your MXit contacts while logged into Facebook. I haven’t covered the Facebook topic much as my motto is Facebook Less. This was surpirsing, a 2012 prediction by Vodaocm, MXit and Google attracted a huge amount of interest. The awesome folks at Samsung sponsored a competition where you could win the Android powered Galaxy Tab. 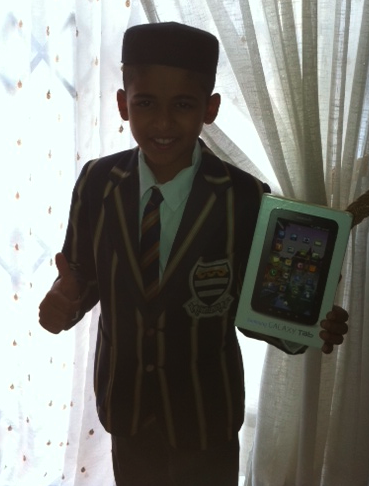 The winner pictured here (or rather the winner’s son) is a future Web AddiCT in the making. To illustrate the competition’s success have a look at the popular posts of all time in the sidebar they remain there for as long as the post remains popular which usually means your brand is visible on every single one of the nearly 2 million page views that occur during the year. The SMS competition alerts (also visible in the sidebar) that goes out to nearly 4500 opt-in subscribers ensure people know about competitions as soon as it happens. From this listicle to another. 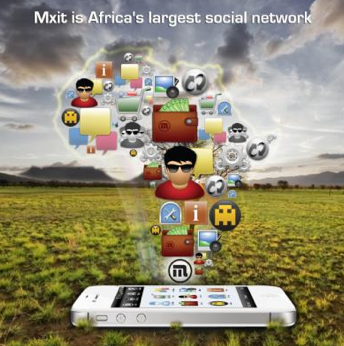 Here are a few of the MXit games that can be played on Africa’s largest social network. There you have the Top 11 Blog posts for 2011 published here. If you’d like to write some guest posts feel free to contact me via the usual channels. I’d love to see content created by you in the Top 12 list of 2012 🙂 A word to would-be advertisers: Web AddiCT(s); are very selective when it comes to the brands that get exposed to the aforementioned audience. If you believe the campaign you manage or own fits or would like to run competition to reach this audience via the web and SMS. Get in Touch.